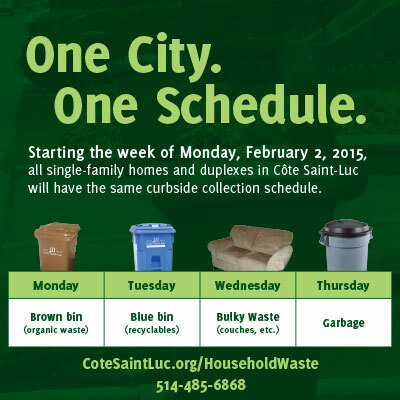 Curbside collection days are changing for most homes in Côte Saint-Luc starting the week of Monday, February 2, 2015. For single-family homes and duplexes, brown bins (organic waste) will collected on Mondays, blue bins (recyclables) on Tuesdays, bulky waste on Wednesdays, and garbage on Thursdays. 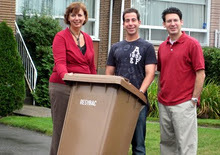 Residents can start placing closed-lid bins at the curb at 10 pm the night before the collection. You can place bulky waste as of noon the day before. Blue bins must be at the curb by 7 am on collection day to ensure it is collected. Brown bins, bulky waste, and garbage bins must be placed by 8 am on collection day. It made financial sense to outsource garbage collection and organic waste collection. The contractor has the capacity to collect garbage from single-family homes and duplexes across Côte Saint-Luc in one day. Same with organics and bulky waste. We decided to simplify collection and schedule it on the same day. 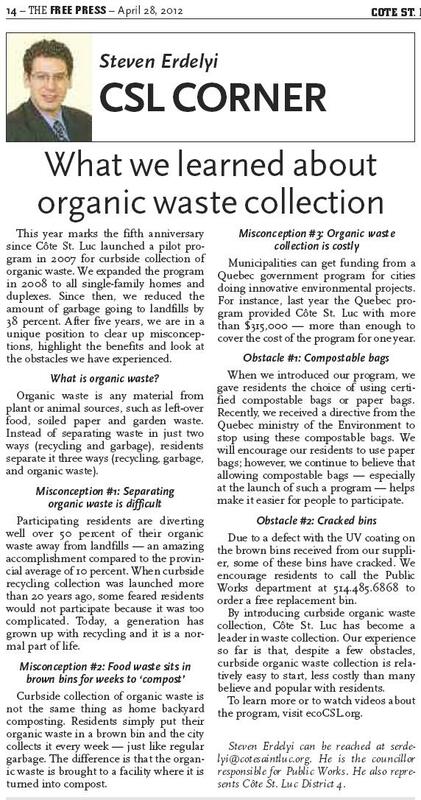 For those townhouses that currently take part in curbside organic waste collection, they will follow the same schedule as single family homes and duplexes. For all other multi-family complexes and institutions, garbage collection is on Mondays and Thursdays, recycling collection remains on Tuesdays and bulky waste collection is on Wednesdays. For old electronic items (computers, monitors, etc.) and household hazardous waste (paint, CFL bulbs, etc. ), residents can bring these to the EcoCentre at 6925 Côte-des-Neiges or Public Works (7001 Mackle Rd.). Call 514-485-6868 to arrange a pick up at the curb of an old TV. Côte Saint-Luc is mailing a flyer with the new collection days information to all homes, doing a city-wide phone call out, and sending an email to all those subscribed to the Côte Saint-Luc e-newsletter, among other things. 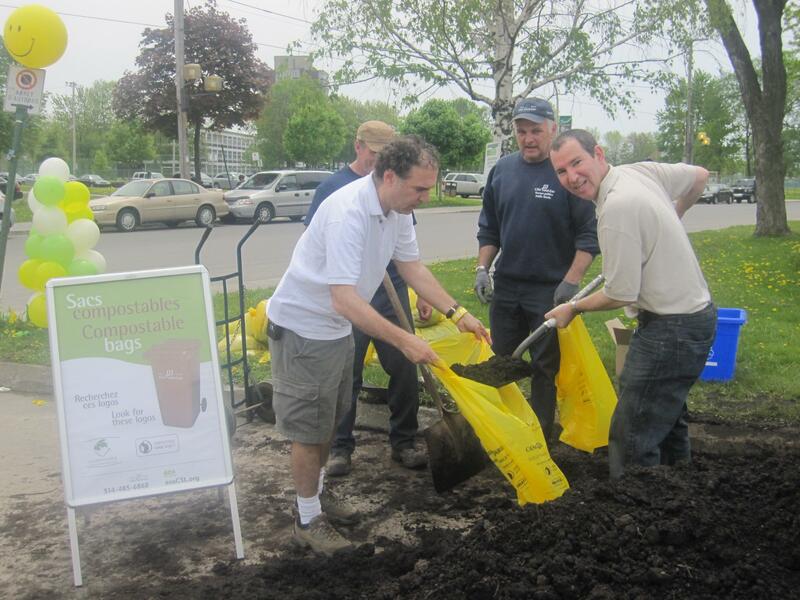 Residents of the City of Côte Saint-Luc can collect free compost at the Great Compost Giveaway on Thursday, May 31, 2012 from 2 pm to 8 pm at the Public Works Department Building. Côte Saint-Luc is distributing 20 tons of compost in all. Every household is entitled to 120 litres. Residents can bring their own empty 40 litre buckets to help cart away the compost. Bags will be available for residents without buckets. Residents should bring a utility bill or some other official document showing they live in Côte Saint-Luc. The compost comes from the St. Michel Environmental Complex, which distributes it to communities. The compost comes from green waste derived from leaves. For more information, contact the Côte Saint-Luc Public Works Department at 514-485-6868 or bnewman@cotesaintluc.org. The Public Works Department Building is located at 7001 Mackle Rd. Here’s an excellent piece by District 4 Councillor Steven Erdelyi. Steven is responsible for the Public Works dossier. He is an excellent Councillor, highly intelligent and devoted to his constituents, his portfolio and indeed all residents of the City. Free Press, April 25, 2012. Click to enlarge. 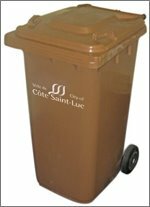 Many Cote Saint-Luc residents have been experiencing a frustrating time with their brown bins for the household composting program due to the lids cracking off. 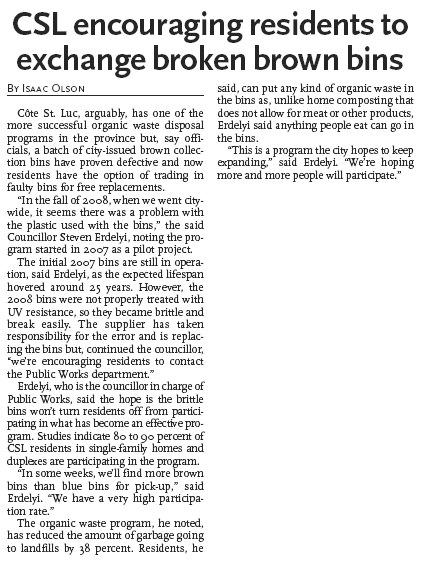 Mayor Anthony Housefather announced at the December public council meeting this week that the manufacturer has agreed to an initial replacement of 500 bins. The Mayor told resident Bernie Tonchin that the default was not due to the lifting system and that the manufacturer has indicated that there is a problem with the UV stabilization in the material causing the plastic to age much faster especially on the sun exposed areas. The city wants to ensure that its curbside compost initiative continues to be a positive program, providing our residents with the opportunity to participate fully. Therefore, staff is currently encouraging residents to have patience and advising them that new bins are on the way. The annual Côte Saint-Luc Public Works Week Carnival took place on May 22 and hundreds turned out to this event which combines education and a whole lot of fun. Also known as Eco-Action Day, booths were set up for young and older to learn about the environment while the Public Works fleet of shiny white vehicles was on display. Councillor Mike Cohen and I even pitched in by shovelling some compost material into one of the many yellow bags being given out to the public. 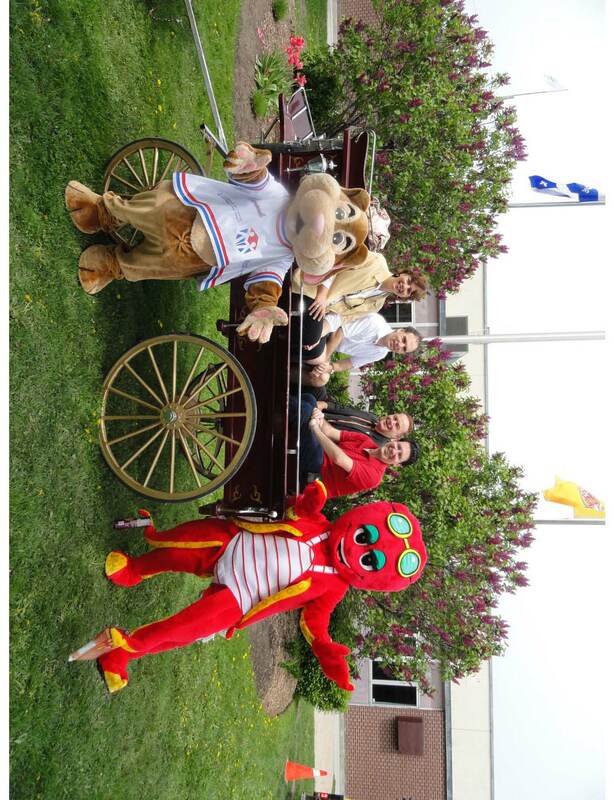 A donation to the Montreal Children’s Hospital Foundation gave kids access to real vehicles, inflatable games, face painting/tattoos, flower planting, arts and crafts, fun and games. There were balloons, TCBY. hot dogs, cotton candy and snow-cones, face painting and tattoos, flower planting, arts and crafts, demonstrations and Eco-Action Day. Everyone on hand got to learn more about recycling and organic waste collection and received free garden compost. Used bikes were accepted on behalf of SOS Vélo. (With reporting by Cllr. Mike Cohen. Photos by Bebe Newman. ).